Fast acting. Disposable. Premoistened. Deep cleaning, non-scratching abrasives quickly remove embedded grime. Leaves hands clean, conditioned and softened. Improves workplace productivity by reducing costly clean-up time. Towel/Wipe Type: Hand/Body Wet Wipe; Application: Hand Washing; Applicable Material: Hands; Face; Dirt Types: Grease; Grime; Soil; Oil. 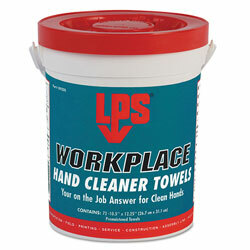 Waterless Hand Towels from LPS! 510 In Stock today.